Garry Kimble scores the only goal of the game for Posh against Liverpool. The class of 1991-92 have passed all the credit for one of the most memorable seasons in Posh history onto their manager. Garry Kimble was the man who scored one of the most famous Posh goals of all-time when Liverpol were beaten 1-0 at London Road in the Rumbelows Cup. Neither player wanted to take any credit for their starring role in Posh history in the 24 hours after their manager Chris Turner lost his long battle for life. Charlery said: “He was the man at Peterborough at that time. Nothing any of us achieved would have been possible without Chris. “I scored the goals at Wembley, but I wasn’t fooled into thinking I was the star. “That was Chris’s team and the way he put it together and the way we played so hard for each other was down to him. “He was a hard man at times. He once dropped me from an FA Cup tie against Spurs at London Road because I had missed training and he wasn’t afraid to let the media know it was because I’d been out drinking the night before. “He rubbed some people up the wrong way because of hi s honesty and fearless decision-making, but we all knew we would be out of the door if we went against him. “We als0 knew that he was nearly always right. “He is easily the best manager I have known. He was a top-notch person as well. “If you played ball with him, he would look after you and there were a lot of players in that side who owed him everything. “Let’s face it we were a team of mediocre players when Chris was managing us in the Fourth Division. I was certainly mediocre when I was one of six players to sign on transfer deadline day in March 1991, but Chris made me a better player and I had a decent career because of him. 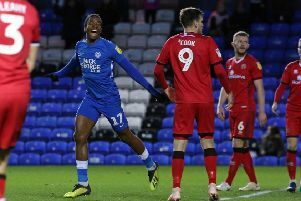 “He also extended the careers of experienced professionals like George Berry, Paul Bradshaw and Phil Crosby by making Posh into a strong, successful side. “It wasn’t until Chris signed Tony Adock and Bobby Barnes from Northampton that we had the quality to win a second promotion. He instinctively knew which players to sign and he invariably got them on the cheap! The winger had previously admitted Turner was a managerial genius who plotted Liverpool’s downfall with meticulous detail. Bobby Barnes turned up at London Road In January 1992 and enjoyed a magical 12 months towards the back end of his career. Barnes issued a statement of condolence through his employers, the Professional Footballers Association. He said: “Chris was my manager at Peterborough United in the early nineties when he took the club through the leagues up to the Championship on what could only be described a shoestring budget. “A big strong centre back in his playing days, he was an ‘old school’ manager who created a tremendous team spirit and desire to win within the squad. Barnes can rest assured about that last point, judging by the reaction of fans, playing team-mates and managerial colleagues since he passed.